The highest-rated hotel in Nha Trang, Mia Resort Nha Trang was established in 2011 and has been #1 on TripAdvisor’s Nha Trang list since their opening. Receiving plenty of accolades, including the Luxury Hideaway category in 2015’s edition of World Luxury Hotel Awards, the resort prides itself on its unique, personalised service and high standards. This 5-Star luxury beach resort, located just 20 minutes from the city centre, has a range of accommodations. Here you can choose amongst condos, beachfront and cliff villas and 2-bedroom and 5-bedroom oceanfront villas. All of this, surrounded by lush, manicured tropical gardens and a private beach; this resort is perfectly designed to soothe and inspire your senses. 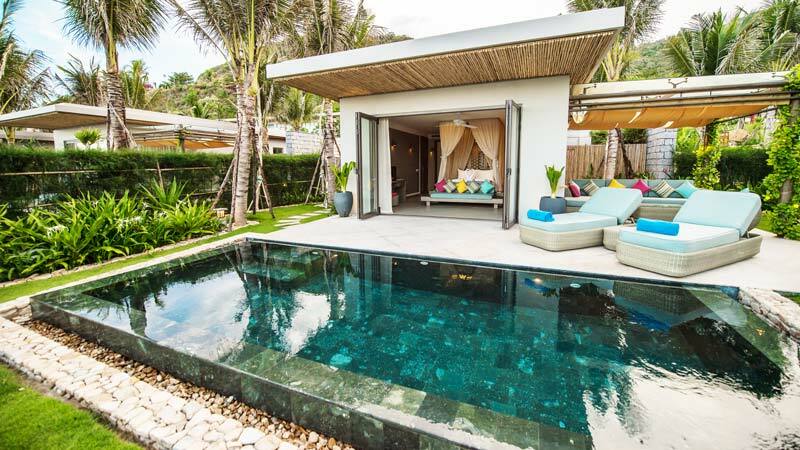 The cliff and beachfront villas, as well as the 5-bedroom villas, are the resort’s best-selling attractions. These abodes are spacious, yet private, and are perfect for family vacations or group trips with close friends. The majority of the rooms feature an excellent view of the ocean, perfect for those who love gazing into the horizon in comfort, with the knowledge that room service is just a call away, 24/7. With a minimalist concept in its design combined with modern architecture, the resort is well-integrated with its natural surroundings and follows an eco-friendly principle. Mia Resort Nha Trang also provides tours in different categories, from land activities such as sightseeing, waterfalls and cycling; marine activities such as boat trips, kayaking and snorkeling; and cultural trips allowing you to visit the countryside and temples, with a tour of the city. The private beach is within walking distance from all the lodging and the waters of Nha Trang Bay make for excellent scuba diving, snorkeling or swimming, no matter your skill level. You just need to visit the PADI Five Star Dive Center to get started. If you’re just looking to soak in the sun, you have exclusive access to the resort’s private beach; if you don’t like the sand, two large infinity swimming pools are available too. For those who prefer not to get wet, and would rather sweat, there are gym facilities, as well as tennis courts and a 2.5km running route to get your adrenaline fix. Dining options are aplenty at Mia Resort Nha Trang, with two acclaimed restaurants and a cocktail and tapas lounge serving up different international cuisines. Sandals Restaurant & Bar, winner of the World Luxury Restaurant Awards in the Fusion Cuisine Category for Asia in 2017, serves world-class Vietnamese and Western cuisine. Besides its comfortable atmosphere, the restaurant is known for its traditional culinary delights made with the freshest ingredients. At Mojito’s Bar & Lounge, you can find Asian-style tapas paired with surprising drinks and cocktails crafted by their in-house mixologists. The tapas are inspired by the broad flavours of various Asian cuisines. This is the only late night bar on the premises, open daily until 1:00 a.m.
La Baia is an Italian restaurant tucked away in Mia Cove. Here you’ll find a perfect hideaway setting that gives you a taste of Europe with authentic and classic Italian dishes. Several nights per week, the resort restaurants host special themed evenings for guests to enjoy. You can take part in Asian street food nights, tropical island nights, wine tastings, beach BBQs… All featuring delicacies and live entertainment to the tune of the night’s theme. Mia Resort Nha Trang also boasts a range of facilities to help you relax and rejuvenate. Their award-winning Xanh Spa provides body scrubs, luxury facials, massages, manicures, pedicures and many more wellness and beauty treatments. Need further proof of its excellence? The spa recently won the Condé Nast Johansens Readers’ Award in 2017. If you’re visiting over the weekend, be sure to take part in a complimentary yoga class offered every Sunday on the private beach at 7:30 a.m., with yoga mats and props provided for your convenience. The experience doesn’t just end after sunset. At night, the resort comes alive with the Asian street corner, which highlights street food delicacies from Asia, as well as a seafood barbeque and an Italian buffet. - Ranked #1 by TripAdvisor against 213 hotels and resorts in Nha Trang since they opened. - “Winner Certificate Of Excellence” by Tripadvisor for five consecutive years, from 2012 till 2016. - Winner of the World Luxury Hotel Awards for the Luxury Hideaway category in 2015. - The Xanh Spa received the “Condé Nast Johansens Readers’ Award 2017”. - Finalist for the Best New Boutique Hotel In The World 2012. - Runner up for the Best Budget Hotel, The Smith Hotel Awards 2013. - Rated Exceptional (4.8) by Hotel.com in 2017. 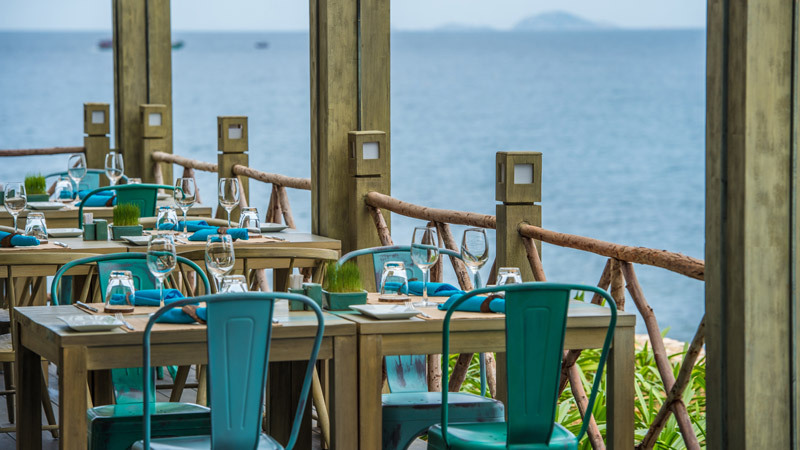 - Sandals Restaurant at Mia Resort Nha Trang was the Continent Winner Asia of World Luxury Restaurant Awards for the Fusion Cuisine category in 2017. Rated exceptional (4.8) by Hotel.com in 2017, the resort also ranks #1 out of 215 properties in Nha Trang on TripAdvisor with a perfect 5 stars. Most of the reviews focus on the service, and the personal touch the resort gives to its guests, which makes them feel at home. 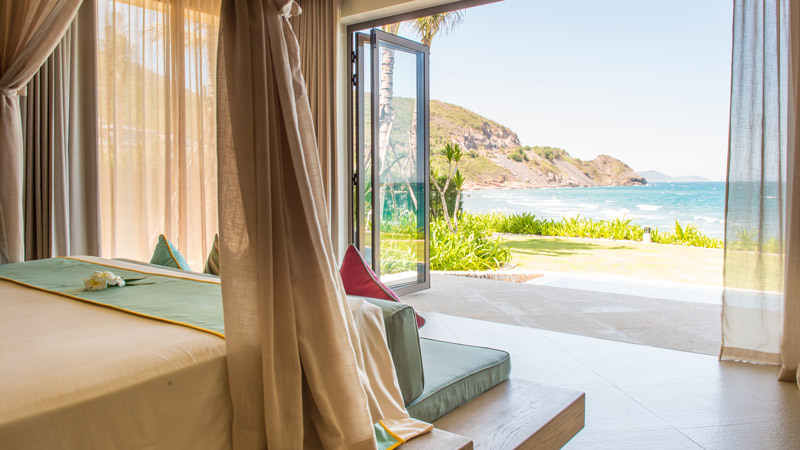 The reviewers also raved about the views overlooking the bay, the private plunge pools as well as the quality of the food in the three restaurants. A resort is more than just an accommodation. It provides an experience, from tours to activities, delivered with the added personal touch of the staff. Mia Resort Nha Trang is perfect if you’re looking for a break from a hectic life—not only will you be relaxed, you will be recharged too.